Want to be part of the team? 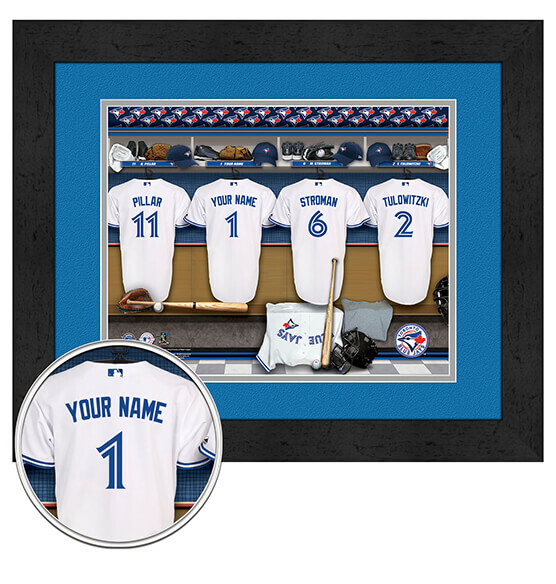 For the ultimate fan zone, check out our Toronto Blue Jays Personalized Locker Room Framed Wall Art. Customize this high-quality framed print with the name of your choice and stand among the Blue Jays greats in this locker room scene. This fantastic MLB baseball custom sports decor looks great wherever you decide to hang it thanks to its elegant black frame and its digital double-mat setting in Blue Jays team colors. Great for holiday, anniversary and birthday gift-giving, this personalized Toronto Blue Jays framed artwork will be one gift they will never forget!